Lawrence Durrell, at least in the Alexandria Quartet, is a pretty incredible writer. At once consistently overdoing it and subverting himself and his characters throughout. I read these books not long after finishing writing my last novel, and saw an immediate parallel, sort of a reinforcement of what I was doing on a much smaller scale. It made me feel good about my book despite the rejections along the lines of this is wonderful but it won’t sell. A few years later I switched to painting, thinking it would be a clean break-a very different way of thinking about the world. It is, of course, but I find myself treading the same ground. Or put another way, that novel, which dealt a lot with questions of art and the creative impulse, was like a prerequisite for what I am doing now. 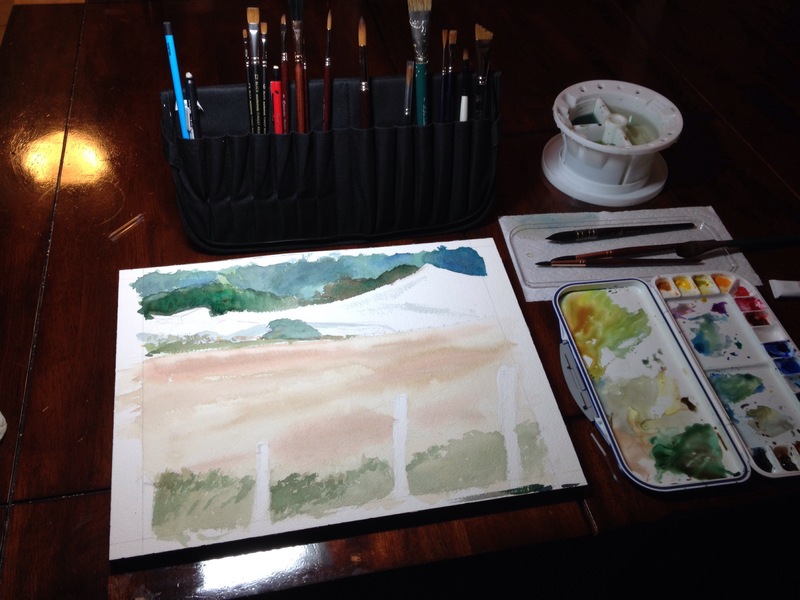 The landscape in that novel very much resembles the landscapes I have been painting recently. Taking up Durrell again, I am once more thinking of what to do with my last novel, how to bring it together with visual art. More on that to come over time, though probably not quickly. Tonight I out on some Kris Kristofferson and made some good progress on this new painting, posted above. I want to name this one after the house back on the left, I just don’t know what color I will paint it yet. In real life it’s a blue-grey but I am not so sure it will work well like that in this painting. I may have to do a few sketches to sort that part out. I wasn’t in the mood for that tonight so I started in on some of the larger areas to push this past the early painting block. Time for a break and some reading. I like where this painting is headed, and I agree with you that blue may not be the best color for the distant house. Your narrative also got me thinking about graphic novels…not that I’m familiar with too many, or know the current trends. Maybe it would be a real innovation to have a graphic novel that’s about monochromatic watercolor vignettes rather than B/W line work, and a way to bring both of your skills to publication! . Thanks. Nice thought about a graphic novel. I worked on the text for one with a friend a couple years ago and saw how much work the art is. The commitment is incredible.